Your support is greatly appreciated and so much needed. Together we are changing the conditions for women and their families in childbirth throughout Honduras! Dar a Luz operates as a non-profit, relying on outside funding, donated supplies and volunteered time. The work we do here is valuable, and we gratefully appreciate your support. We are trying to raise a total of $8,000 from supporters like you. $100- helps with cost of upcoming seminars for Gynaecologist Resident Doctors. Of course, any amount you are graciously willing to donate, we humbly recieve. Why is there a need for transformation? 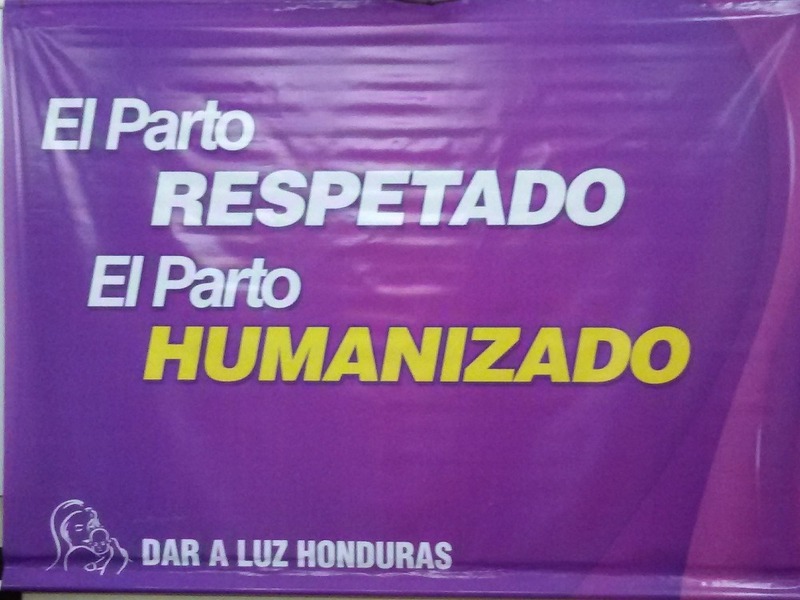 The campaign for Respectful Maternity Care and Human Rights in Childbirth is one of it's kind in Central America and has the potential step by step to completely change the face of labour and delivery in Honduran hospitals. Our campaign provides seminars, workshops, hands on trainings, and much more. The environment surrounding birth in the public hospitals is often very stressful for women. Women labor in one room without privacy, are relegated to their beds, and are separated from their family members. Often staff has not had basic training on how to support women through labor. Kind words are rare, almost no instructions on breathing or relaxation techniques are given to the women. Sometimes, basic medical information is not provided. Through our campaign for Respectful Maternity Care and Human Rights During Childbirth, we have already seen an improvement in these areas. The largest hospital sees around 60 births a day, also 2000 medical students and 1000 nursing students get trained here each year. Making change with these students in the public hospitals of Tegucigalpa will have ripple effects throughout the whole country. Just as important as the reduction of unnecessary/harmful practices is improving the treatment of women during labor and birth. Often, staff does not recieve any training on how to support a woman during labor and birth. and little information is provided over performed procedures. Generally, women are not given the expected attention and compassion they need. Your support is key in helping women throughout Honduras have a better birth. Help us raise funds so we can continue improving maternal and infant health throughout Honduras! Dar a Luz Honduras was founded by Silvia Bahr and is a grassrootsorganization. Here is some of our work on our Campaign for Respectful Maternity Care and Human Rights in Childbirth. With your help we could successfully reduce the use of harmful fundul pressure in the second stage of labor in one of the biggest hospitals in Honduras.We humbly thank all of those who support this important work here! Thank for supporting our work! Help facilitate a childbirth education class at a local health center! These classes help prepare mothers for labor and delivery and demonstrate relaxation. Sponsor a trip to the mountains to work with the rural midwives and help improve their care of the women in their communities! Purchase a kit for one of the rural midwives that we work with. Each kit includes a fetoscope, gloves, scissors, and a measuring tape. Support education in Tegucigalpa at the National University, the largest university hospital in Honduras and conversations with the Ministry of Health. Support midwife, doula and childbirth education for local women and teenage girls who wish to become labor support for their communities. Ongoing research to collect oral histories of local midwives and parteras about their knowledge, experiences and cultural practices. A campaign to protect the perineum and decrease epsiotomies during childbirth. Last year in a local hospital, episiotomies were used in roughly 80% of births. I worked with Silvia remotely from Copan Ruinas in 2015. It was a transformative experience and I only hope I can do more work with Silvia in the future. Liebe Silvia! It's been so long that I've wanted to send you this money. Sorry it took so long. Please take it for whatever project you feel is most urgent. Sensing you lots of love and gratefulness for all that you do!